A consumer insurance information blog by Renaissance Alliance, a consortium of New England independent insurance agents, focusing on news, information and tips to take the mystery out of insurance. Home fires can happen any time of the year, but there are special risks over the holidays. 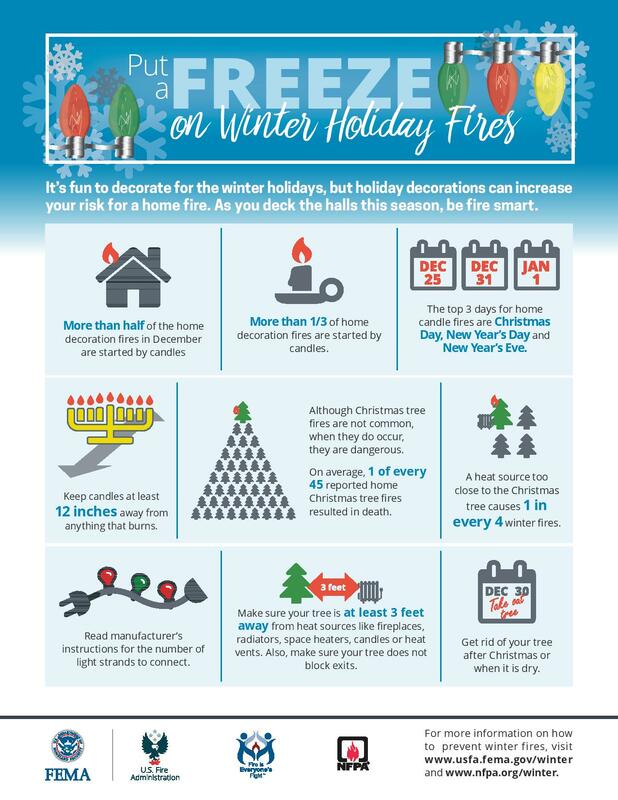 Two very common activities that are popular at the holidays are often the source of fires: Holiday decorating and holiday cooking. For example, the top three days of the year for home candle fires are Christmas, New Year’s Day and New Year’s Eve. The National Fire Protection Association and the United States Fire Administration urge people to Put a freeze on winter fires. In this post, we focus on holiday fore prevention. We’ve included a video and infographic from the “Put a freeze…” campaign, as well as holiday decorating tips that they suggest. Only use decorations that are flame-retardant or not flammable. Check holiday lights each year for frayed wires or excessive wear. Don’t link more than three strands of holiday lights. Never leave a burning candle unattended. Consider using battery-operated flameless candles. Choose a tree with fresh, green needles that do not fall off when touched. Before placing the tree in the stand, cut 2” from the base of the trunk. Make sure the tree is at least three feet away from any heat source, like fireplaces, radiators, candles, heat vents or lights. Make sure the tree is not blocking an exit. Add water to the tree stand. Be sure to add water daily. Use lights that have the label of a recognized testing laboratory. Some lights are only for indoor or outdoor use. Replace any string of lights with worn or broken cords or loose bulb connections. Read manufacturer’s instructions for number of light strands to connect. Never use lit candles to decorate the tree. Get rid of the tree after Christmas or when it is dry. Dried-out trees are a fire danger and should not be left in the home or garage, or placed outside against the home. Check with your local community to find a recycling program. The AAA Thanksgiving press release offers a chart with the worst time to hit the road in America’s largest cities and the worst travel times to the nation’s busiest airports. 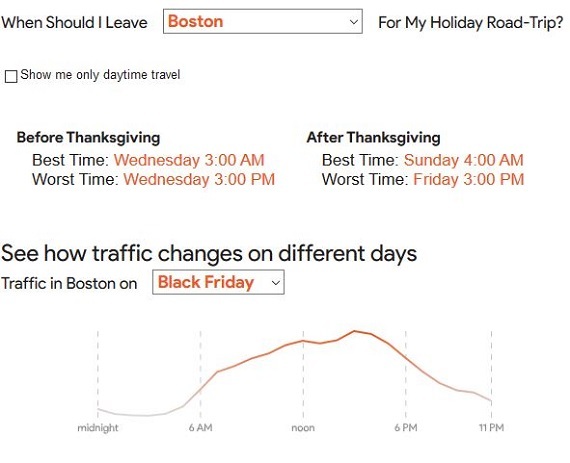 For Boston, they suggest that the worst time to hit the road is between 4 to 6 PM, noting that I-495 S from exits 41 to 33 will be the most congested. All in all, they say to expect a 3.5x delay multiplier. As for factoring in weather conditions while you travel, AccuWeather says the northeast should expect bouts of snow and slick travel ahead of a frigid Thanksgiving. See maps for when and where the wintry mix is expected. For another cool planning tool, Google’s Mapping Thanksgiving 2018 is an interactive feature that uses data from 2017 to offer insight into the places people visit around the holidays, when to visit them, and the best times to get on (or stay off) the road. You can search by state, view traffic patterns in key metropolitan areas and use an interactive feature to find out the best time to start your road travel. This year marks the 100th anniversary of the end of hostilities of World War I, which occurred in 1918, and was know as Armistice Day. 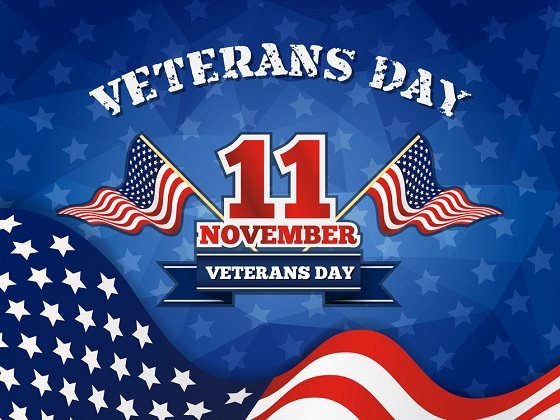 Today, it honors all veterans, past and present. It’s a time to recognize and pay tribute to those who put their lives on the line for their country. 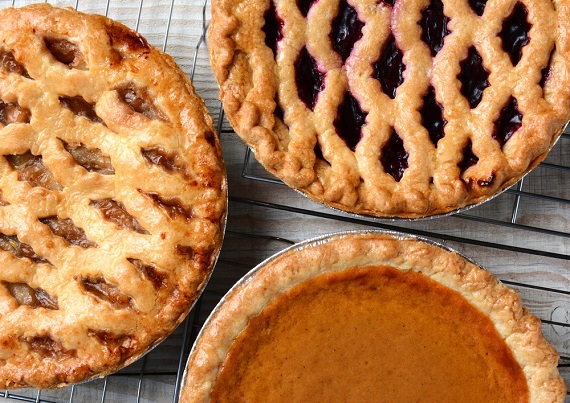 There are a few misconceptions about the holiday. To set the record straight, the Defense Department offers 5 Facts to Know About Veterans Day. It’s one of 10 federal holidays. Although it falls on a Sunday, federal offices will be observing it on Monday and will be closed. About 20% of all employers observe the holiday, also – so if you have business plans on Monday, double check to be sure that offices are open. Here are a few resources to learn more about the historic anniversary this year. The 100th anniversary of the end of World War I. Reflections from the homefront and Europe. We’re so lucky to live in a country where every voice counts. That is, it counts if you exercise your right to vote! In record numbers, people have been taking advantage of early voting, but for many, going to the local polling place on election day is a cherished tradition. We’ve compiled some last-minute voter information for New England states to help ensure you’re ready for the big day tomorrow. 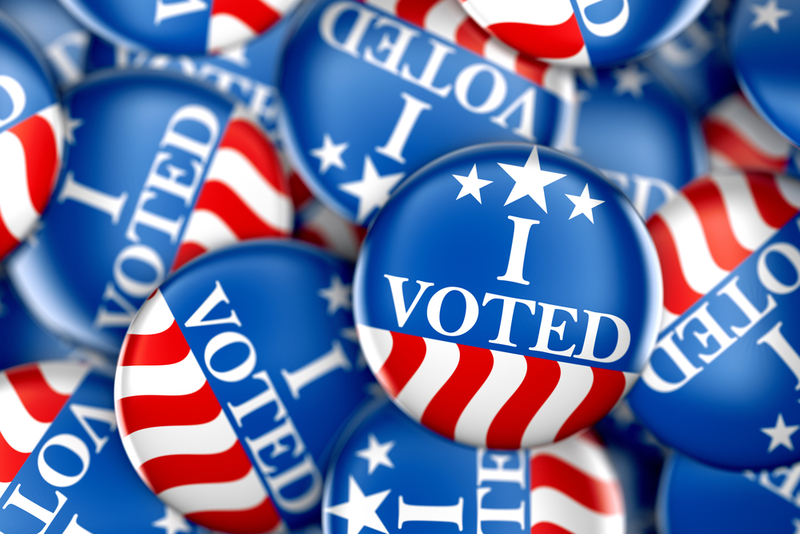 Polling places must be open from 7 a.m. until 8 p.m., though towns are allowed to open as early as 5:45 a.m. Voters who are in line when polls are closed at 8 p.m. must be allowed to vote. For an election or primary, polls in Connecticut are open from 6 a.m. to 8 p.m.
Any elector standing in line at the polls at 8 p.m. will be allowed to cast a vote. All polls in Vermont open between 5 and 10 a.m. and close at 7 p.m.
Polling opening times vary by municipality. Local officials can give you the exact opening time for your municipality. All voting places close at 8:00 pm on Election Day. National Association of Secretaries of State offers voting tools at Can I vote. These include Find your polling place and Valid forms of ID, among others. Ballotpedia Sample Ballot Lookup tool – Ballotpedia is the digital encyclopedia of American politics and elections. Our goal is to inform people about politics by providing accurate and objective information about politics at all levels of government. 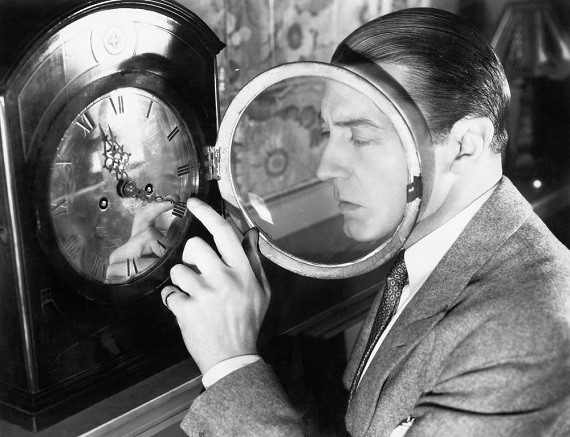 This week, Daylight Saving Time is ending, don’t forget to set your clocks back. If the whole business makes you irritable, you are not alone. Check out this amusing clip – you might relate. An hour may not sound like a lot of time to you, but try explaining that to babies, toddlers and pets who don’t understand why their routines are arbitrarily thrown off. Plus, even if it doesn’t sound like much, it can affect our routines and confuse our biological clocks off until we get into the groove. In a Daylight Savings explainer, Vox talks about some of the ways that the shifts involved in time changes can affect us. In 1999, researchers at Johns Hopkins and Stanford universities wanted to find out what happens on the road when millions of drivers have their sleep disrupted. Analyzing 21 years of fatal car crash data from the US National Highway Transportation Safety Administration, they found a very small, but significant, increase in road deaths on the Monday after the clock shift in the spring: The number of deadly accidents jumped to an average of 83.5 on the “spring forward” Monday compared with an average of 78.2 on a typical Monday. And it seems it’s not just car accidents. Evidence has also mounted of an increase in incidences of workplace injuries and heart attacks in the days after we spring forward.